Named, as the school is, after St Declan, it is only natural that elements associated with the saint would appear in our crest. Thus, the round tower which still stands beside Declan’s grave in Ardmore, is depicted as a prominent centre-piece in the design. It is set against a background of changing tidal waters, neatly symbolising the continuity of the saint’s mission through centuries of change. The radiating star above the tower is the symbol of the light of the Christian message which the school aspires to hand on to the pupils. “They that instruct many into justice shall shine as stars for all eternity”. The shield, of course, is taken to represent the barrier which true education can offer against the evil influences of life. It is surrounded by a laurel wreath – the reward for effort and success. Surmounting all, however, is the cross; ‘no cross, no crown’. 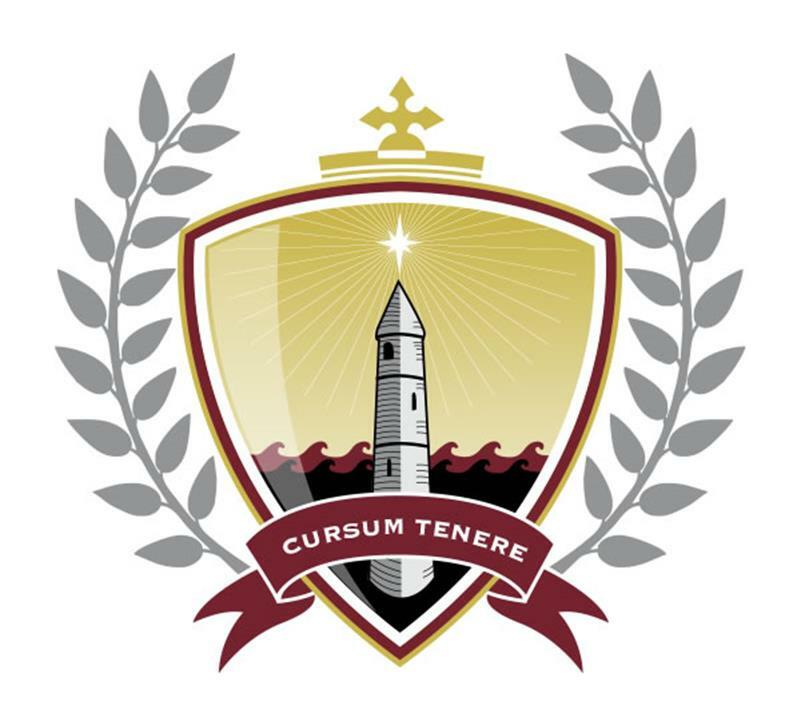 The motto is a very appropriate one, Cursum Tenere (Finish the course) comes from the great worker St Paul. It has a double significance in a school context: finish the course of study and, more importantly, fight the good fight to the end of one’s natural course on earth. This done, that laurel wreath assumes more significance than we originally intended for it is as a prize for temporal victory. Directly inside the main door of the B block entrance, an excellent stone-and-glass replica of the crest has been placed in a prominent position. Effectively illuminated each morning, it is a constant reminder to the entire community of St Declan’s of what the school is all about. Those who designed the crest originally were obviously motivated by the highest ideals.